So it's come back round to that time of year again where my age goes up by a year (yet the mental age goes down). For some reason I'm really not looking forward to my birthday this year. Normally I get really excited about things like birthdays and Christmas, but not this year. I don't know why, maybe because I don't want to be 20, maybe because I've had a rubbish week and I'm not in the mood for anything, maybe becasue I'm awful at arranging things so haven't actually planned to do anything for it. Either way, I just don't wanna. But! Despite this, I thought I'd make a little wishlist of birthday presents to help the friends and family who read my blog and don't know what to get ;) I just want to say that I am in no way, shape or form expecting all of this, or even anything for that matter. It's just a few little ideas of things I'd use a magic wand for! Top left to right: Juice Couture rucksack, metal alphabet stamps, Victoria's Secret rucksack. Middle: (this one is for Jack) house bracelet charm to celebrate moving into our flat. 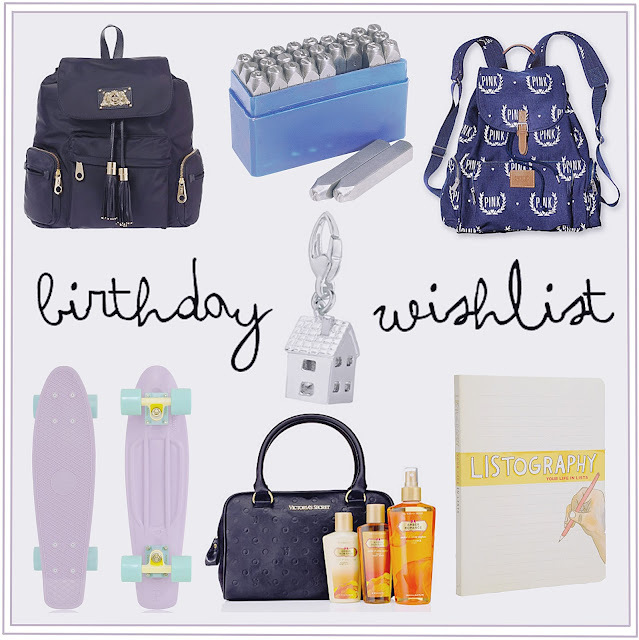 Bottom left to right: lilac Penny board, Victoria's Secret gift bag, Urban Outfitters listography book. the stamp and listography book looks so interesting! The Victoria's Secret bag is GORGEOUS!